These decorative clothespins are super easy to make, cheap, and can be useful in so many ways. I bought the clothespins at my craft store, Crafts and Stuff. 30 clothespins for $1.99. I got a bulk scapbooking paper pad at Wal-mart for $10.98 and have used it for a ton of different projects. You can get this paper at any craft store. 1) Measure the side of the clothespins and cut strips of your scrapbooking paper to fit the sides. 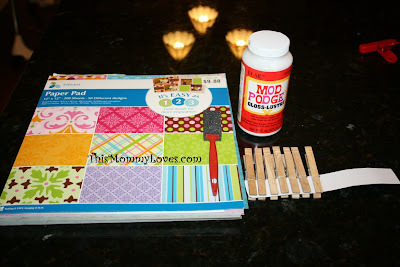 2) Lightly brush a thin layer of Mod Podge on one side of the clothespin and attach the strip of paper. 4) Once both sides are dry, brush the top of each side with another layer of Mod Podge to seal the paper in. Be careful on this last step, not to get the Mod Podge glue on the hinge of the clothespin or you will glue the pin shut, thus not being able to use it as a clip. So cute and easy, right? You can also attach a magnet to the back. And use it as a fancy refrigerator magnet clip. Or string up some twine or ribbon to hang greeting cards or family photos. I use them to hang wet bibs to dry. They also can be great teacher gifts, or neighbor gifts, or girlfriend gifts. 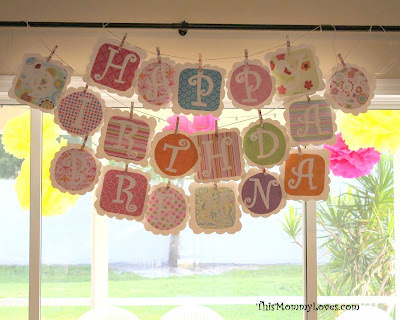 I used them to hang my daughter's birthday banner. For complete party details, be sure to visit my Pancakes and Pajamas Post. Also from the Pancakes and Pajamas Party is our Giving Tree and we use these decorative clothespins to hang our donations. Don't you just love an easy, multi-purpose craft project?!?! I love the ones you made for me! I also like how you took about a 10" piece of twine & tied the ends together to make a circle. The decorative clothespins are clipped to that & it makes a cute decoration when not using the clips. Would also be a nice way to present the clothespins when giving as a gift. Awesome! I saw this on Etsy but now I know how to make my own! 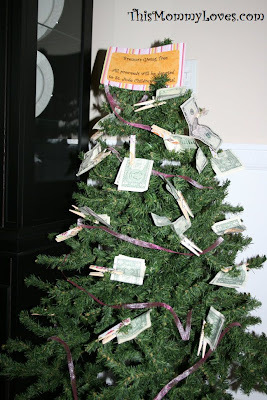 :) Looks pretty easy..
That's an awesome idea, Jenni! wow! I got a couple of these as a gift but hadn't thought of their true potential! I think I'll be whipping up a batch of these for Xmas this year! SO CUTE! Love your ideas I am following you now!! Kudos! Great ideas! I'm a new follower! Simple and cute the best kind of ideas! Hi! I found your blog through The Girl Creative Party Blog. I'm going to use this for a baby shower I'm planning in November. I love cute clothespins!